The teachings on mind training, or lojong, are an invaluable aid to practitioners because they show us how the wisdom and skillful means of the Mahayana can actually be put into action. They show us how to make it real. The lojong teachings include instruction in formless meditation, in the practice of “sending and taking” (tonglen), and in postmeditation practice—putting our meditation into action in our daily lives. These teachings are attributed to the great tenth-century Buddhist master Atisha Dipankara and became widely known after the Tibetan teacher Geshe Chekawa arranged and summarized them in a collection of fifty-nine mind-training sayings or reminders. Often referred to simply as the Atisha slogans, these encapsulate the essence of what it means to practice the Mahayana. The Atisha slogans are a blueprint for practicing the bodhisattva path in fifty-nine easy steps. The power of the slogans is that they break down the Mahayana ideal of loving-kindness for us. Rather than simply giving general guidelines on how to be a true practitioner, they actually spell it out in detail. They give specific guidelines both for how to approach meditation and how to awaken in daily life. It is easy to be vaguely compassionate and generally aware-ish, but when we actually look at what we are doing and how we interact with others, it is a different matter altogether. As the saying goes, the devil is in the details. When I first encountered the practice of tonglen and the fifty-nine mind-training slogans attributed to Atisha, I was struck by their combination of down-to-earthness and profundity. 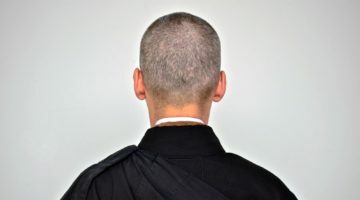 I had already been taught about the importance of joining formal sitting meditation with postmeditation practice, but apart from a vague notion of trying to be more kind and aware, I was not at all sure how to go about it. These teachings gave me a way to unpack general notions such as compassion or wisdom into specific guidelines that I could apply to my life. They placed the practice of meditation, which was what had inspired me about the tradition to begin with, within a greater and more complete understanding of practice and what it means to be a practitioner. Studying the mind-training slogans inspired me to look into my habit of dividing meditation from everyday life, regarding it as something special and apart. When I began to really take a look at that pattern I saw that it fostered a kind of leaky approach to practice. If meditation became too intense I could escape into everyday concerns; when daily life became too overwhelming I could escape into practice. There was lots of wiggle room for neurosis. Somehow it all seemed to come back to ego and its genius for co-opting everything to further its grip on power. The scope of the Atisha fifty-nine slogans is extensive, and they can be applied to many levels of our activity. They provide guidelines for meditation, but their real focus is on relationships of all kinds: with the earth, with our fellow humans, with our colleagues, with our closest friends, with our enemies. At first glance some of them may seem like practical advice from your grandmother. Slogans such as Don’t wallow in self-pity may seem moralistic or even simpleminded. At the other end of the spectrum, slogans such as Examine the nature of unborn awareness seem to be pointing beyond the ordinary to something more ultimate and perhaps even a bit obscure. Yet they are combined into one coherent system. With slogan practice, every situation is seen as complete, as an expression of both skillful means and wisdom. That means you do not need to look elsewhere to find the dharma, since it is present in every situation. On the other hand, it also means there is nowhere to hide. Once you have a glimpse of the extent of the teachings, they haunt you wherever you go. Generally, no matter what you do, you need to learn how to go about it. Depending on what you want to achieve, you train in different ways. If you want to practice law, you go to law school; if you want to practice a trade, you go to trade school. And if you want to become a bodhisattva, you train in the six transcendent perfections (paramitas) through mind training and slogan practice. In the Mahayana, the goal is to become a bodhisattva warrior who embodies wisdom, compassion, and openness, and the way to do that is by training in generosity, discipline, patience, exertion, and meditation. These five are the methods that will get you there, the skillful means. But those skillful means need to be joined with wisdom, or the vision to lead the way, which is prajna, or transcendent knowledge. Together, these six perfections are the Mahayana recipe for success on the path. Working with the slogans begins to chip away at attitudes that hinder our relationships, our inner understanding, and our happiness. This chipping-away process begins with meditation practice, with the pacifying of our restless mind. With that foundation, we can begin the practice of tonglen. In tonglen, we practice reversing the habit of viewing everything purely through the lens of our own self-interest. Instead we begin to appreciate how we are continually in interchange with other beings. So tonglen opens up the possibility of relating in a more flowing and genuine way, one less caught up in fear and self-protection. We see that we do not have to just passively accept the relationship patterns we have fallen into. We can make changes. In tonglen, we breathe out what we normally cling to and breathe in what we usually avoid. In doing so, we work with qualities within ourselves and with issues that arise in relating to others. The Atisha slogan related to this is number seven: Sending and taking should be practiced alternately. These two should ride the breath. 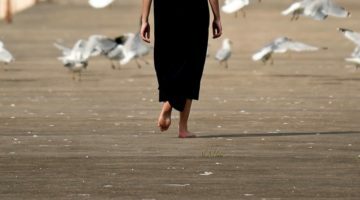 It may seem crazy to practice breathing in what you do not want and breathing out what you desire, but rather than being self-destructive, this exercise is surprisingly liberating. You discover that the habit of trying to protect yourself by holding on to some things and getting rid of others does not really protect you; it just makes you mildly paranoid and defensive all the time. When you are not battling against whatever is bugging you at the moment but really breathe it in, you realize that you don’t have to take everything that happens to you as a personal attack. It is just what is happening, and you can find a way to deal with it. On the sending-out side, you begin to realize that you do not have to parcel out your limited store of goodness or health for fear of running out, and you can let it flow more freely. The less you try to hold on to whatever virtue you have as your little treasure, the more there seems to be. Making it your possession has been like trying to drive with the parking brake engaged. This practice is remarkable in its effects. When you are not so caught up in sucking in goodies and warding off threats, when you are not so attached to perfection and afraid of flaws, you can come to accept yourself and others in a new and fresh way. This reduces burnout and defeatism. When people encounter you, they sense that you are not trying to use them, even subtly, to further your own schemes. I think this is one reason that tonglen is such a healing force and is so helpful for people who work with pain and suffering in their line of work. With slogan practice, we step-by-step liberate trapped energy, energy recruited to the project of propping up ego. That project is based on fear. Whenever we mess up we worry about being caught. We even worry about catching ourselves. So we waste a lot of energy covering up, being defensive, or making excuses. According to slogan twelve—Drive all blames into one—most of our problems can be traced to one underlying cause: ego fixation. Until we start to deal with this level, we will only be treating symptoms. With this slogan we take responsibility for our own actions. Instead of hiding our mistakes, we face them and look for their underlying cause. And the more we look, the more we understand the power of ego clinging and the damage it does. We begin to have a glimpse of what a difference it makes when we are not carrying around the hidden agenda of ego. This slogan is also helpful when we are dealing with groups, where it is common to get in struggles about who is to blame, as though finding the guilty party will solve the problem. With this slogan you take on the blame yourself, no matter what the case. By doing so, the process can shift from one of finger-pointing to one of problem-solving, to the benefit of the whole organization. This does not mean that you do not try to discover where specific problems arise. In fact you are more apt to figure this out, since you have removed the need for others to cover up or to defend themselves from attack. Another powerful lesson of slogan practice is how to relate to the ups and downs of life. Slogan forty-two—Whichever of the two occurs, be patient—is a reminder of how easily we are swept away by the excitement of things going our way or the disappointment of things not working out for us. When things are going well, we forget that it will inevitably change. Witness the optimism of the housing bubble. When things go downhill, we tend to get in a funk and see no way out. Witness the doomsday phenomenon. This fluctuation in circumstances can take place on a grand scale or simply as the ups and downs of an ordinary day. Instead of just experiencing what we are experiencing, we either hope to get out of it or fear losing it. The practice of this slogan is to stay with present experience and not assume anything about what may follow. This allows us to find our ground in ever-shifting circumstances, and by example to provide that ground for others. 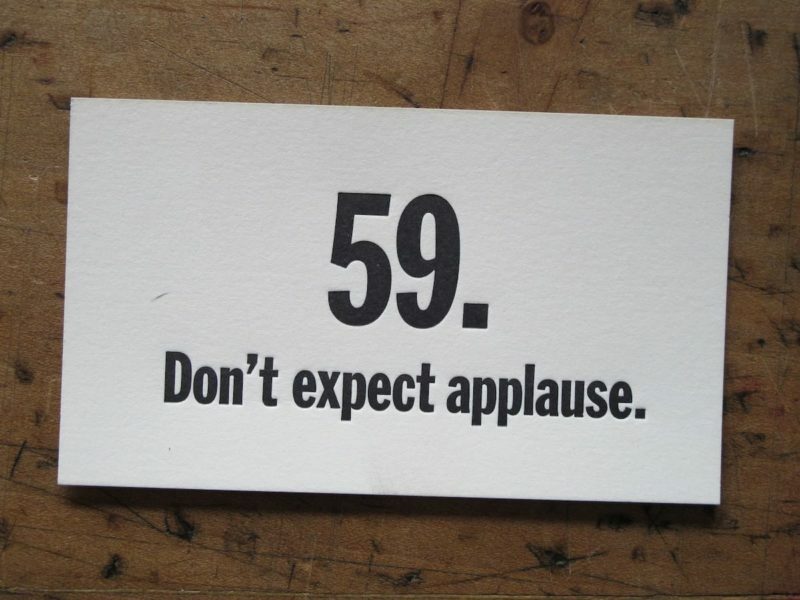 The Atisha slogans conclude with number fifty-nine: Don’t expect applause. When we are always looking over our shoulder to see how others think we are doing, it is hard to act directly and skillfully. The result of our need for recognition is that we feel disheartened, belittled, or furious when it does not materialize. It is hard to maintain steady effort when we give that power over to others, and we find that we are not really in tune with what we are doing. With this slogan, instead of looking for recognition from outside, we develop the confidence to trust the action itself for feedback. If outside recognition comes, that’s great, but if not, it’s no big deal. The mind-training slogans skillfully prod us to lighten up and drop our pretentiousness. Instead of just talking about being loving or compassionate, they spell out how to do it. Their focus is on actions, not just attitude. We could have all sorts of loving and kind thoughts, and feel all warm and fuzzy, but so what? The point is to help this world, ourselves, and others at the same time, and we have the means to do so. Every time we are pricked awake by one of the slogans, and adjust our attitude or behavior, we expand our understanding of what it is to be skillful. Working with the Atisha slogans is a wonderful way to bring practice into all aspects of your life. They work not by grand gestures, but by the accumulation of many little interruptions to the momentum of ego confusion. In the midst of activity, a slogan pops up, and in an instant you change course. In that way, little by little, ordinary actions are liberated into bodhisattva activity. Because it is so easy to lose track of practice mentality and work from a more shallow and conventional fallback position, it is good that we have these handy reminders to wake us up on the spot. Through the power of mind training, we never run out of opportunities to flip our limited actions into the skillful methodology of the bodhisattva path, and our limited vision into the penetrating insight of prajna. Choose one of the following lojong slogans to work with over a period of three days: Be grateful to everyone; Always maintain only a joyful mind; Don’t try to be fastest; Don’t be swayed by external circumstances; or Always meditate on whatever provokes resentment. On the first day, use the slogan to reflect on how you relate to your spiritual practice. On the second day bring the slogan to mind in reflecting on how you handle personal relationships. On the third day, apply the slogan to your relationships with colleagues and your approach to your work. For more on the practice of lojong, see Training the Mind and Cultivating Loving-Kindness, by Chögyam Trungpa, and The Great Path of Awakening: The Classic Guide to Lojong, by Jamgön Kongtrül.